Neo-psychedelia is the coolest genre in today’s underground scene and Brighton’s Acid Box Promotions well captures this growing scene. Lorenzo Ottone meets the founders Polly Miles and Ollie Thomas. It’s the classic seaside town stormy night, the place is Brighton’s pub and live music venue The Hope and Ruin. I sip an ale in a traditional pint mug- if I were Michael Caine I’d tap on it and ask for a thin glass- and skim through the pages of a psychedelic music magazine as I wait for the interview. As I walk the stairs that lead to the gig room, muffled south Californian vibes from Dead Coast’s (one of the acts on the bill) soundcheck come from a closed door. There I meet Polly and Ollie, the minds behind Acid Box Promotions. Polly Miles, 21, from Brighton, in a trippy vintage shirt, 60s looking green suede skirt and grunge-style worn out Docs, has soon to leave because American psych-garage Night Beats, the night’s main band, needs to be driven to the venue. I stay with the other half of Acid Box, Ollie Thomas, 22, from Brighton, a chatty and creative guy with an 80s-looking moustache. 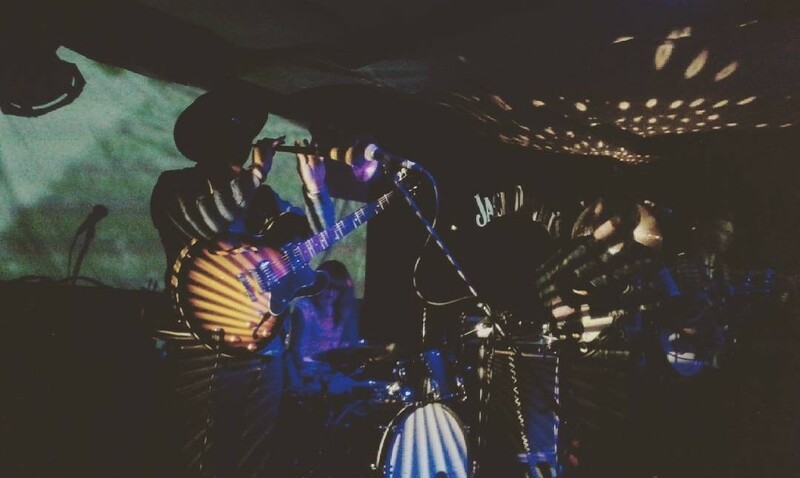 Acid Box is one of Brighton’s most successful psychedelic and garage music nights. It moved its first steps already in 2013, but it was taking part in organising different nights as One Inch Badge and Late Night Lingerie that really helped Ollie and Polly to stand out. According to Ollie: “We started helping people and setting up a night in Eastbourne called Teen Creeps, that gave us the confidence and the right contacts to start setting up our own night.” Acid Box soon developed within the Brighton music scene and it is now a known trademark with people trusting in it, as its recent bookings for DJing at Lewes Psychedelic Festival and Manchester’s Cosmosis Festival witness. “We started to have a bit of fun and we didn’t think we could end up in sold-out shows with people telling us ‘Oh, you put on my favourite band!’” says a pleased Ollie. 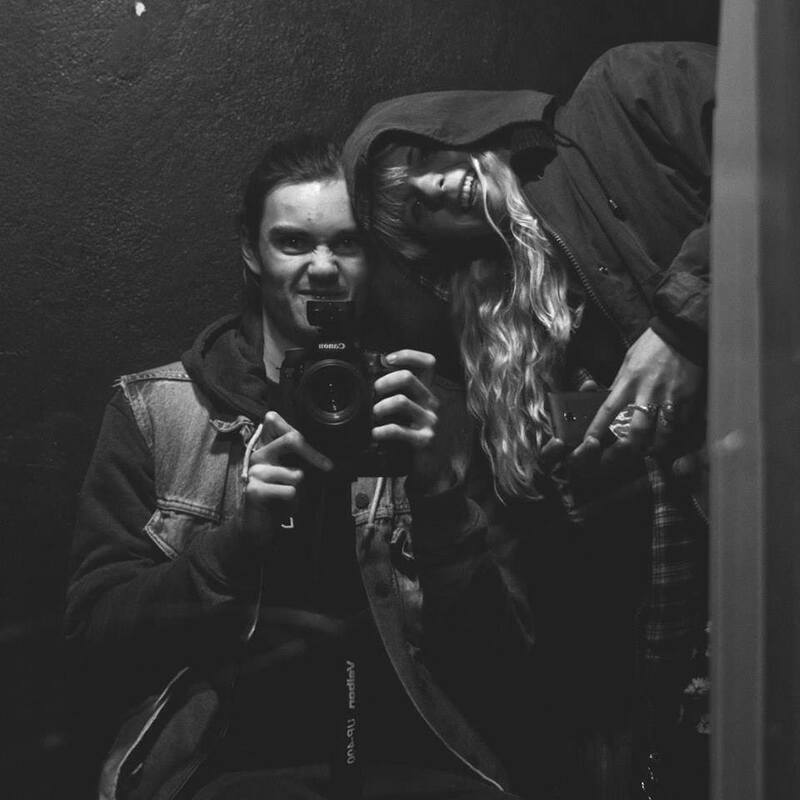 The choice of psychedelic music can seem a bit controversial since the sounds inspiring Ollie and Polly have been the garage, punk and grunge bands booked for Late Night Lingerie nights. Those inspirations have then been mixed with the classics such as The 13th Floor Elevators to create a more contemporary interpretation of psych music, but at the same time linked to its garage and fuzzy American origins. A key influence for Ollie has been Brian Jonestown Massacre, a band that with its 60s-inspired sounds and look in the 90s can be seen as the forefather of nowadays neo-psychedelic scene. Ollie says: “I watched Dig! (2004 documentary on BJM and Dandy Warhols) and said ‘I need to start something like this.’” In addition to this, music is something that has always belonged to Ollie’s family, with the father working as a roadie and the grandfather DJing in the 60s before and after gigs of teen-favourite bands such as The Who. Undoubtedly this left an heritage that can be heard in Acid Box DJ sets made both of digital formats and vinyl. As Ollie states: “We started collecting records and play them at Late Night Lingerie, where we learnt how to DJ. 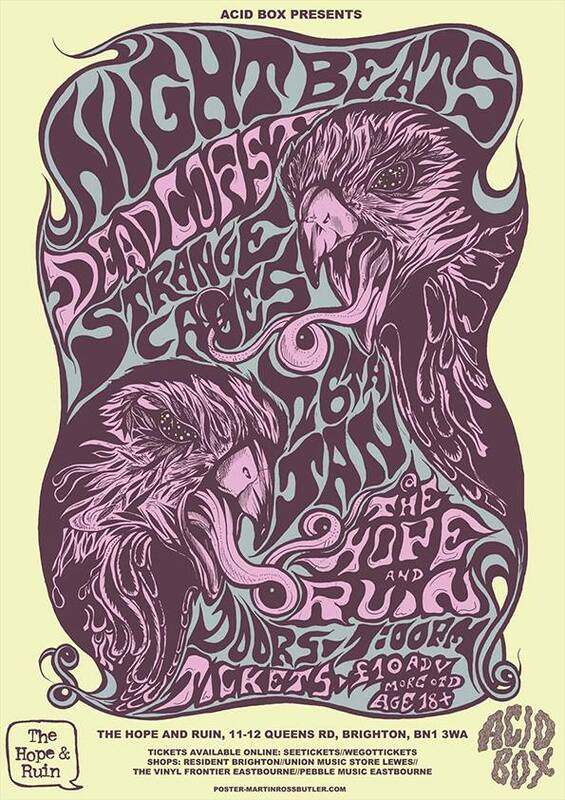 Now we both play old stuff, Stones, Who, Seeds and promote acts who will come to Brighton.” Promotion of new acts is certainly a great point of Acid Box whose organisers even asked The Night Beats to suggest them new bands from their hometown for DJ sets. The choice and booking of artists is made easier by Polly who works for Drink In Brighton, the company that runs venues The Hope and Ruin and Sticky Mike’s Frog Bar. “She fills the calendar for them. This makes it cheaper for us and saves time.” says Ollie. Being in Brighton is a further advantage for Acid Box. “Here there is a big melting pot of people who want to be in rock bands, as in Manchester.” Add to this the yearly turnover of students, especially of those studying at music-specialised BIIM, and here’s an assured quantity of both new bands and spectators. Who Sold My Generation (to psychedelic music)? 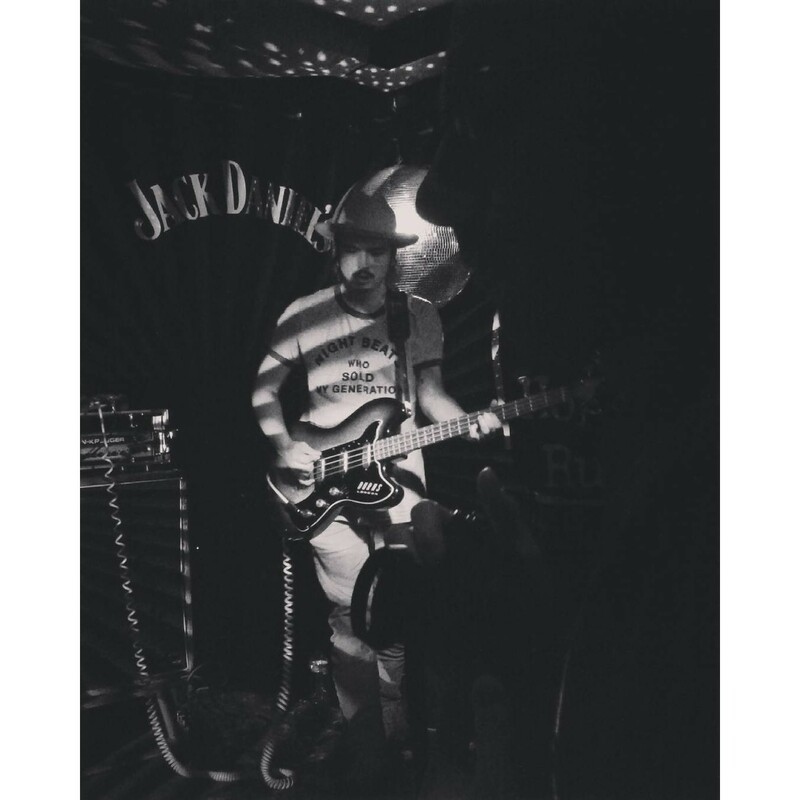 – Texan outfit Night Beats performing at The Hope and Ruin for Acid Box. Acid Box isn’t the place for nostalgics, it is the mirror of on-going UK, US and European neo-psych and garage scenes. There you can meet hip-dressed mature 60s-fanatics as well as young hipster-looking students, without forgetting many youths who are tripping for the first time into the kaleidoscopic 60s. This mixture- like it or not- is the strength of one of Brighton’s top music nights.